Once an traditional home built in 1924, Sleeping Dragon Hostel is now the perfect stop for backpackers, hostelers and anyone else traveling through Shanghai on a budget. While the building was recently renovated in 2008, it maintains a distinctly classical feel, resulting in a quirky blend of Chinese tradition and modern flair and convenience. Think chandeliers meet bunk beds, elaborate columns meet Beijing opera masks and antique Chinese furniture meets funky, modern artwork. While Sleeping Dragon Hostel has clean and modern rooms, facilities and conveniences, we are located in a very colorful, traditional Chinese neighborhood. Come here to get a taste of what life in Shanghai is really like. We are also located within 5 minutes (2 blocks) walking distance of the convenient metro line 4, to connect you with the rest of this fascinating and modern city. - Colorful maps to help you find your way around Shanghai, China and The World. - Mini Souvenir Shop with assortment of post cards and other last-minute gift ideas. Click HERE to see our current menu. 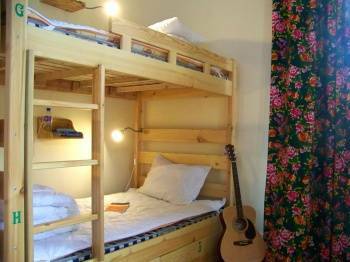 The heart of our hostel lies in our warm and inviting dorm rooms. We encourage our guests to mingle and make new friends. The dorm rooms are an important contributor to this aspect of Sleeping Dragon. Due to the classical nature of our building, our dorm rooms are rather large. However, they manage to be warm and cozy, with spacious high ceilings and ornate balconies. Each comfy bed has it's own light and shelf for keeping your stuff, as well as an electrical outlet. Linens are included in the bed price. Also included is a key to locker where all of your belongings will stay safe. The brand new toilets and showering room are just across the hall, for easy access. We have both mixed dorms (¥45) and a 6-bed female dorm (¥50). We also have rooms for those who require a little more privacy. Prices are seasonal and per person per night. Ensuite rooms include a private bathroom. The Sleeping Dragon is nestled right in the heart of bustling old town Shanghai, an area bursting with Chinese culture and lifestyle. Warning: While Sleeping Dragon Hostel has clean and modern rooms, facilities and conveniences, we are located in a very colorful, traditional Chinese neighborhood. Come here to get a taste of what life in Shanghai is really like. Western restaurants such as KFC, Pizza Hut, Dairy Queen, a combination cafe-bakery and Starbucks. In the common room, order one of our delicious Western Breakfasts or try a delightful Chinese treat or two. If the guest cancels at least 24 hours in advance, only the initial deposit is lost. Afterwards, the first night's room fee is charged. From Pudong Airport, or Honqiao Airport , simply hop in a taxi and give the driver our address in Chinese characters. From Pudong Airport expect to pay about ¥150 and from Honqiao expect to pay around ¥100. From the Shanghai Railway station, the metro is the most convenient mode of transportation. If you happen to be coming by metro, take metro line 4 to Linping Rd. You will then have a 5 minute walk down Zhoushan Rd. until you arrive at the hostel. Look for our Sleeping Dragon sign out front, at number 394. Once you've arrived, taxis and metro/ subway are the most convenient ways to navigate Shanghai. Taxis can be caught just in front of the hostel and there is only a short, 5 minute walk to the Line 4 subway stop at Linping Rd.